It's one thing to call your catch Maine lobster when it's caught by commercial fishermen, frozen, and shipped hundreds of miles after weeks out of the sea. It's another thing to call your catch Maine lobster when it tastes just like it does for the locals who live right by Maine's cold, salty waters. 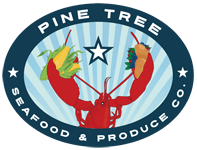 Pine Tree Seafood Market specializes in live Maine lobster sourced by the Pine Point Fisherman Co-Op just 3 miles from our location on Route 1, as well as several other local fishing companies dedicated to sustainable practices. We also have a variety of fish available, including haddock (a local favorite), as well as salmon, halibut, flounder, and sushi-grade yellow fin tuna. Our products are always day boat-caught, ensuring the catch reaches our store no more than a few hours from the sea. We work with local fishing companies for two reasons. One is that locals are able to provide the freshest catch. The other is that these companies share our commitment to supporting the local businesses and residents that make our community great. When you order our quality local sea food, you are not only getting it fast and fresh; you are also getting a taste of community pride.